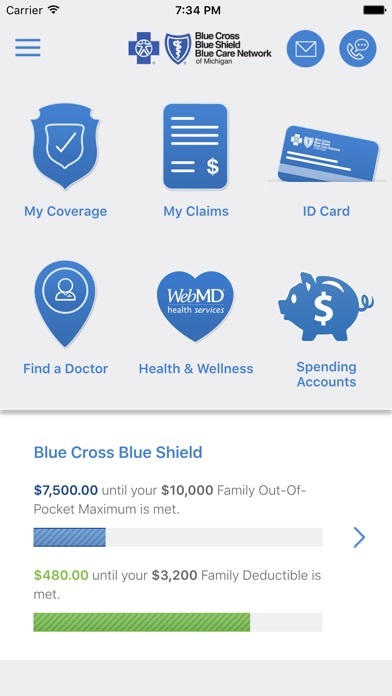 Michigan Blue Cross® members, use our app to log in, find a doctor and see your account info. With convenient access to your health plan details, you’re more informed when you need care. If you’re a Blue Cross Blue Shield of Michigan member, you can: -- View your deductible and other plan balances -- See what services your plan covers -- Check claims and EOBs -- Check your HSA and FSA account for users that use our Health Equity partner -- Pay your plan bill for users with non-employer coverage -- Find doctors and hospitals in your network -- Select and view your Primary Care Physician -- Have your virtual ID card handy -- Take your health assessment -- Compare quality ratings for doctors and procedure costs -- Research drug prices and requirements -- Easily call customer support and our nurse line -- Keep your secure account info updated The app supports most of our plans, but not all. 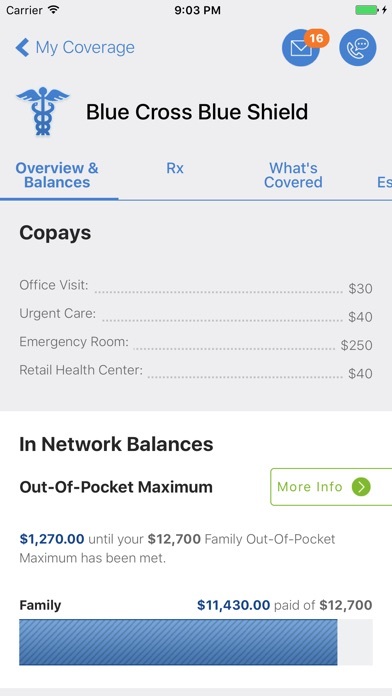 If you’re one of these members, the app won’t work for you: -- FEP members with a PPO plan -- MESSA members -- Blue Cross Complete (Medicaid) members Questions about the app? Please visit bcbsm.com/appsupport. © 1996-2018 Blue Cross Blue Shield of Michigan and Blue Care Network are nonprofit corporations and independent licensees of the Blue Cross and Blue Shield Association. We provide health insurance in Michigan. Can’t find a doctor, can’t edit my account info, getting a message saying “Carmelo’s account info has been updated” (who is Carmelo?) Basically, nothing is working. I can’t count how many times I’ve tried to access information and it just sits there loading. Whether I’m on WiFi or not, it takes forever. It’s pointless to have the app if I can’t use it. I can’t get the app to open. It just sits there and spins after I authenticate. Very frustrating and it is a Saturday so I can’t get support help. Was looking for a co pay for an urgent care. Why is there not the option to add your insurance card to Apple wallet??? Please add ASAP! The app has stability problems on iPad air, runs only once after initial installation. Won’t close properly, and won’t reopen. please bug fix. Does face recognition and then just sits and clocks. Nothing loads. I’ve uninstalled and reinstalled 3 times. VERY frustrated & just sick & tired of this app never working!!!! Guess 1 more uninstall is in my future!!! Worked wonderfully for months. All of a sudden, I cannot log in. It accepts my ID & password but the app will not load. Is there a glitch here? Very frustrating. Never fails when I need to use it. It never logs on. That dumb circle just turns and turns and nothing but you can bet when I don’t need it and the icon is accidentally tapped it loads right away. The app never loads anymore. No idea why. Making it hard for a busy person such as myself. Unable to do anything other than log in. Screen freezes when you click anything else and then app says it encountered an error and logs you out. I have been trying to check coverage for a specific procedure for over 1 week and it isn’t available. What is the problem here??? Most of the time the app works great, but then when you really need to see your card you get that message that says try back later. It gives no reason other than my balances aren’t available right now. I’m trying to view my card, so I’m not sure why that would matter. The app is designed very well and very intuitive. I am able to get to all my insurance, health and wellness, HSA, and doctor information in a tap or two. Touch ID and Face ID support is really helpful in logging in quickly. This is one of my most frequently used apps along with my other banking apps, mail apps, and games. Awesome App. Thank you. The app is very user friendly! Being able to print or share my information is also extremely convenient! Thank you for considering all of the variables insurance holders encounter. When I try to sign in on a computer the site is always Down or I get stuck in a endless loop of the sign in page. When on the app it will not let me see a list of doctors. Both ways are completely useless. Physical personalized ID cards, both medical and dental, need to be available to all covered persons including me and my son Kurt Whitley. Everyone needs insurance cards with them in case of an emergency. 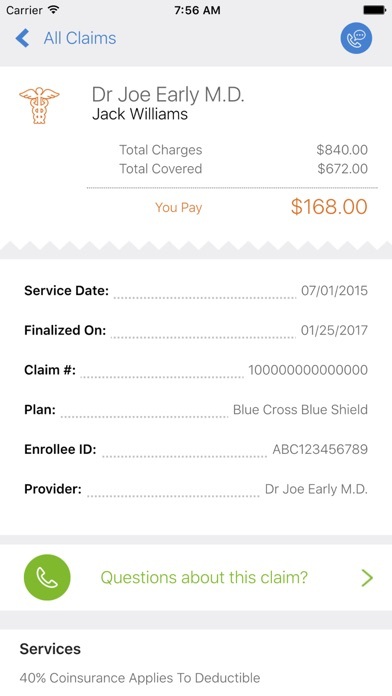 This App helps me review my Claims and EOB at anytime. Under latest update it logs you out the instant you log in. If you’ve always wanted an app you can’t ever use, this is for you! Continues to say I need WiFi with the app. Ummmm. I have unlimited data!! I can check 3 different bank accounts, but can’t seem to see my BCBS account without connecting to WiFi. Ummm no. I will only say this “We’re sorry we can’t get your COB (coordination of benefits) at this time... Tried this twice and that was enough... Done using the app. By We need a better app! No longer works with my ipad 2. It suggested I update and when I updated to this new version, no longer can I get access. Please fix this for us poor people that can’t afford a new iPad. Does not work!!!!! I downloaded this to make it easier to check my EOBs and just get a General overview of my account. It easily displays all my information. It sure why it’s got such low raising from people. Used my same log in as the website. No issues so far. Won’t take a picture of my insurance card and will not accept my member ID number. 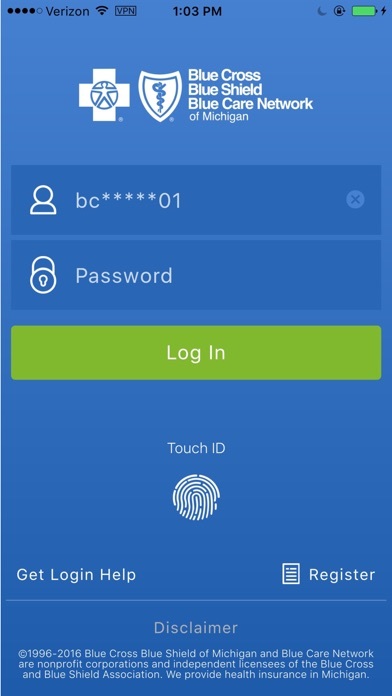 Easy to login using thumb finger print on my iPhone and all the health care information is in my Palm with this app!! Do not enable Touch ID. It locks you out of your account and you’ll have to end up typing in your password anyway. Enabling Touch ID is basically as simple as copy and pasting code that Apple provides. It’s incredibly embarrassing that Blue Cross’s programmers couldn’t handle that. App won’t even login. Just freezes on login screen. Absolutely useless. This app is decent. But when it logs out my access to my id cards is lost till I figure out the login. Apple wallet! Let me export my ID card to the wallet please. App seems to work OK (Touch ID works for me), but emergency services need to be up front. Preferably on a map and a link to Apple Maps or (better) Google Maps for navigation. Straight line distances are not accurate. If I injure myself away from home, I need to know what urgent care services are near me - covered and uncovered (identified as such). When I’m bleeding, I don’t want to type in a search nor go through a list to try to figure out which is easier to drive myself to. The app is fine with a few issues but they pulled the trigger with this new update. Every time I try to login they tell me there is an update available and if you say now it will not let you login. After last update I can’t even log in now. It does a face scan and then just spins and does not let me in. After spinning for a log time it puts me back on the login page. If I try to manually type in my login or password the app times out and some programming code shows up. Not very useful!! It works fine with my iPhone, but not with iPad (5th) generation). Very frustrating!!! Useless on iPad. App never works when I need it. Can never sign in...it just runs and runs until it times out. The app freezes constantly and periodically kicks you out. Poor programming. Goes into error message and forgets Touch ID every time opened, so password has to be reentered. Defeats the purpose. Before the update on 1-6-18 I was able to view my plan benefits. Now, the app doesn’t show anything and says to try again later. Tried to open the app, username and password are entered, when a popup appears. 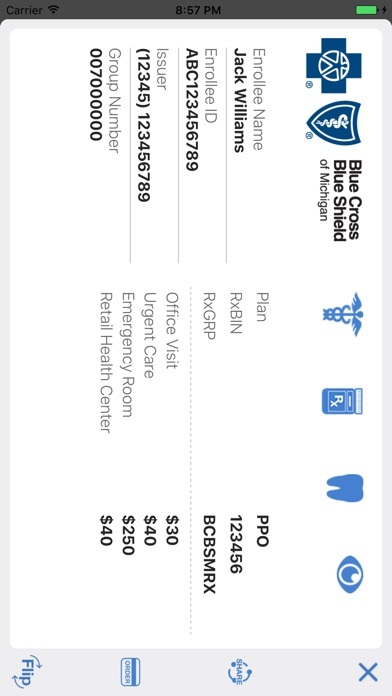 Popup says the app needs to be updated, so I hit update button and the app store appears with the BCBS app on the screen with one option...OPEN. Press the open button and back to the app that says update, press update button and back to open button. Can't update and can't run. Who tested this software?! Very poor. I completely agree with review of Aguazales. The touch I'd doesn't work and the password cannot be posted in. I also use strong passwords and find the sign in incredibly frustrating! This app is completely useless. I spent 20 minutes downloading, creating a profile, and answering an absurd amount of questions to set everything up, only to have the app tell me that my plan information is not available on the app. It won’t even let me search for a doctor. Total waste of time. One star for following reason. Same problem as other user. I to use a password manager. Very frustrating to use this app. Please fix or I say good by. Password manager is Dashlane. Any help would be helpful. Just downloaded the app on my iPhone 7 and was searching for a new doctor, however I am unable to scroll down to see all the results. App is a wonderful idea but not helpful at this point to find a doctor.